This city has so many nooks and crannies to explore, that it’s really up to you to determine how deeply you dive into the Beijing experience. But where do you begin, or continue if you feel like you’ve exhausted everything? Luckily you have us to push you and the fam in the right direction. Personally, when I first came here as a student, I started my journey on foot. After class, I would always get lost walking around, then eventually find a taxi driver and mutter “Dongzhimen” to bring me back to my neighborhood. I didn’t have a smartphone with a map and no concrete idea of how this city was planned. I kept myself within the Second Ring Road for the most part. But it was everything within this Second Ring Road that made me fall in love with this city. I had never experienced anything like the hutongs. Everything from the funny piles of rubbish, men walking with their bird cages, and the various smells (good and bad), filled these neighborhoods with the exotic charm I craved as I explored these streets and narrow alleyways. When I started working with the Beijinger a year later, the city opened up to me even further. This opportunity provided me with a mix of exploring the new and the old, as I was forced to still wander the hutongs looking for interesting local fare, but also check out the latest and greatest openings in the F&B (food and beverage) scene. In addition, I was responsible for a column that would send me journeying through the subway networks to remote areas of the city so that I could check out the landmarks and highlights of these far-flung stations. I loved my job, and everywhere it took me; including that fateful night where I first met my wife-to-be! Now that I’m a father, I’m still exploring. When my son came along, he brought me to new and more family-focused experiences. While this might not seem as fun as going to the latest speakeasy or kaiseki restaurant, I can honestly say that my life now is no less exciting. Despite the past seven years I have spent in this city, I am still no Beijing expert. The journey of exploration continues, which is comforting because new elements of life in the capital are revealed to me almost daily. There’s always more, and it’s never dull, whether it be a distant park, obscure museum, or tasty hidden hutong restaurant. As a city with a population of 21 million people and over 3,000 years of recorded history, Beijing has plenty of stories to tell. Part of our job working at a magazine like beijingkids is to share this info to help inspire you and your family to get out there and experience some of these adventures on your own. So now the ball is in your court! How will you define your Beijing adventure? 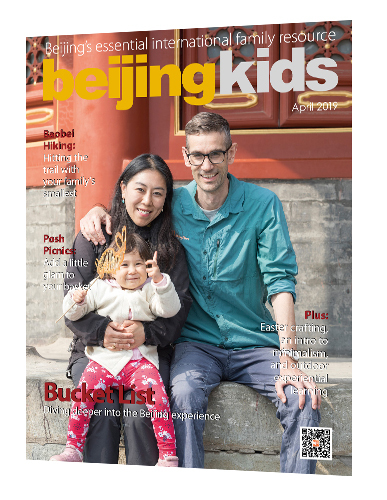 This article first appeared in the beijingkids April 2019 Exploring Beijing issue.